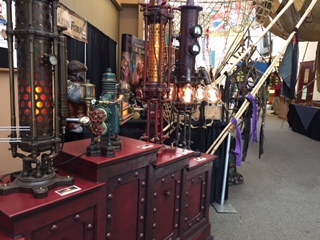 The ambiance of the Second Star Festival is a steampunk pirate event not to be missed. We used to have Faerieworlds in Eugene but it has now moved up to the Portland area. Considering we now have a void in the fairy community, I expected there to be more people at the Second Star Festival when I went. On the other hand, the event is still pretty new. It is my hope that it will grow and their attendance will also grow. Below are reasons to attend next year’s Second Star Festival. Florence is next to the beach so the fair is a great trip on the way to the beach. I’ve always wanted to have an artistic photoshoot at the beach in steampunk clothes like I always see on Pinterest so this might be the perfect opportunity. Florence, Oregon is usually about twenty degrees cooler than Eugene. It was in the nineties at home, but in the seventies with a breeze in Florence. The outdoor part of the fair wasn’t too hot or too cold. This is a great event for August. Unlike all the other outdoor festivals I’ve been to, this had a cool, air-conditioned interior. Actually, unlike all the indoor fairy, steampunk and science fiction themed conferences I went to this summer, this had a cool, air-conditioned interior. Steampunk pirate decorations bedecked the interiors. There were nets, banners, and assemblages all over. Outside at the pool were mermaids. Mermaid sightings have increased at events like Westercon, Gearcon and Faerieworlds in the last couple years, but appearances of mermen are rarer. I was impressed to see a merman with a twirly mustache singing songs with the mermaids. When I walked out and heard them singing “Part of This World” from The Little Mermaid movie, it was magical. What fairy/steampunk/bohemian festival would be complete without belly dancers? Had I known so many people would be dressed as pirates, wearing corsets, sporting wings or painted silver, I would have dressed in my steampunk attire rather than my beach clothes. There were many booths: from upcycled clothing, books, adult coloring books, art and a gallery space and other items you would see at a bohemian festival. Unlike many of the conventions, conferences and fairs I have been to this year, the parking was free. There were constant performances and instructional classes. I was only there for a few hours, but in that time I heard music and saw part of a magic show. The organizers did a good job using their Facebook page to promote and announce the performances that were going on. I plan on being there in 2017. I hope to see you there!